Stardock's latest digital release did so well, it's not going back to brick and mortar shops. When Sins of a Solar Empire: Rebellion - the science fiction RTS sequel to acclaimed Sins of the Solar Empire - went for a digital release last month, it was pretty much an experiment conducted by the developer. It was the first time Stardock had gone for a completely digital release, via Steam, GameStop and its own site. It was expecting Steam sales to cannibalize sales from GameStop and Stardock's site but, not only did that not happen, it moved over 100,000 units in one month alone. Stardock says this success means it will never go back to retail outlet sales. 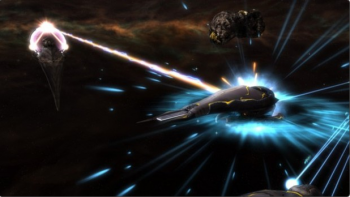 "I remember it was somewhat dramatic in the community when we announced that Sins of a Solar Empire: Rebellion wasn't going to be at retail," said Stardock's head man Brad Wardell. "The reason was because we have moved away from having set release dates, which are largely announced for to kick-off presales, or for shareholders and retail distributors. Now we don't plan a release date until the game has reached a quality level where we feel comfortable doing so." It makes sound sense from a planning perspective to avoid retail, because apart from anything else retail demands a lot of lead time. Space on those shelves is at a premium, and retail outlets need at least six months' warning before they'll consider making space for a new release. By going digital Stardock avoided this process, which meant it could start selling when it wanted to and not when the retailers allowed it to. Stardock has two more titles coming up this year: The Political Machine 2012 - I think this might be about puppies and kittens living together in harmony, or possibly the US Presidential election - and Elemental: Fallen Enchantress , a fantasy turn-based strategy game.